The annual Sound and Vision show is the UK's largest hi-fi exhibition, with around 180 brands represented. It's promoted by What Hi-Fi, Audio-T and Sevenoaks Sound and Vision, the mainstream review magazine and two recently merged retailers respectively. From the name of the show it was clear that there would be plenty of TV and multi channel and this was, indeed, the case. Sony, Epson, THX and Onkyo were there, amongst others, and many of the room sets had a TV at the centre. Nevertheless, the majority of the brands represented were out to show off their hi-fi wares, with a healthy proportion being focused on "Real Stereo". The show was held at the Marriot Hotel in Bristol. Given the size of the event a hotel's probably the most practical venue. It was easily accessible, an early morning dash down the M4 through the February rain. Just a case of stopping before I got to Wales. Happily the rain abated and the sun was shining as I drove round the city to find somewhere to park for less than the cost of a discount interconnect cable (the recommended car park was around £20 for the day!). The exhibition spread across a basement and six floors. First impressions were of the overwhelming range of manufacturers and distributors in this business. Although some of the firms must surely be feeling the pinch following the recession and a couple of important names from the 2006 show were missing, it was great to see so many companies there. The reward for the exhibitors was a good turnout. There was a queue to get in at 9.30 and the space became pretty hectic pretty quickly. The downside was the heat, the pressure of people and the cacophony of music pounding out from around seventy rooms with paper thin walls and, generally, open doors. Ignoring the undoubted attractions of 3D TV our tour starts in the basement where Rega were showing their wares. They had an unusual but welcome approach - a timetable of albums to be played in full - on their Isis CD player and Osiris amplifier. I stayed for a chunk of Catch a Fire and would happily have gone back later for Joni Mitchell's Blue and Miles' Kind of Blue, had time allowed. They were also showing a brand new DAC which was being used for background between the main events. Called, with characteristic directness, "Rega DAC", this centres on twin WM8742 Wolfson DACs, has user selectable filters and a wide range of inputs including USB. Use of computers and DACs was a definite theme of the show with many of the rooms using these at least part of the time. Kef has always followed its own path with a history of innovative designs in the Reference series, and in consumer terms with their multi channel "egg" speakers and Uni-Q coaxial drivers. At Bristol they were proudly demonstrating the "T Series" (T for "Thin") - a newly designed driver specified to fit into a flat enclosure. They have re-engineered the core and the suspension to get a conventional speaker that will compete, size wise, with NXT flat panels whilst claiming to make less sonic compromise. Although primarily a multi channel development, aspects of the technology have been used to improve their stereo speakers. They were demonstrating their revised Q Series which used the new suspension design to allow the driver greater excursion without distortion. The bass response on the new Q500 floorstander was certainly impressive on a quick blast of Bach's Toccata and Fugue in D. Interesting to see technology developments driven by the need to get speakers as slim as a flat screen TV flowing out into improvements in conventional drivers. Moving on from Kef I stopped briefly at the Audiolab/Wharfedale room. Wharfedale were launching a new speaker range called "Jade", and promoting a new Audiolab CD player, the 8200CDQ. I suspect that when I was there the music was originating from what I took to be an i-Pad on top of the rack as the sound was not immediately engaging. The Jade 5 looked the business in piano black though. Chord Electronics and Dynaudio were sharing a corner of the basement. The focus here was on miniaturisation - the Chordette range being tiny versions of Chord's regular hi-fi electronics. Next up was a chance to see how well high end stereo performs in a conservatory. Wilson Benesch were launching a speaker range, the Geometry Series. Their new Vector loudspeaker was playing when I was there, driven by a gorgeous 55watt per channel valve amplifier from Italy - the Mastersound Evolution 845 and having as its source the Wilson Benesch Full Circle deck. I stayed for a while to listen to some sweet guitar playing by the late, great, Michael Hedges, contemplated putting a (much cheaper) stereo into my own conservatory and moved on. The Roksan/Audiovector room was playing some rock guitar which sounded pretty musical from Roksan's new M2 CDP and partnering integrated amp through a pair of Audiovector Si3's. Further down the corridor Spendor was showing its new A3 loudspeaker. Described as an "ultra compact" floorstander and retailing at nearly £1300 it is entering a pretty crowded sector - the small floorstander segment was well represented at the show - although if height is an issue, this was the shortest I saw. Spendor was also one of the few exhibitors to have installed some acoustic panels to improve the chance of a fair hearing. The sound wasn't immediately my thing, but they did produce a fairly big sound for a pretty small box. One of the best sounding systems I heard was in the room set up by the retailer Alternative Audio. This featured a Brinkmann turntable feeding NAT electronics, through ribbon/planar speakers from Analysis Audio. An expensive set up, the speakers alone retailing at £14.5K, and hardly the room to show such a system to advantage, it still sounded a cut above most of what was on offer. Sonic treats continued in the room hosted by Michael Osborn, MD of Air Audio. Air are the designers of the Astin Trew range of electronics. 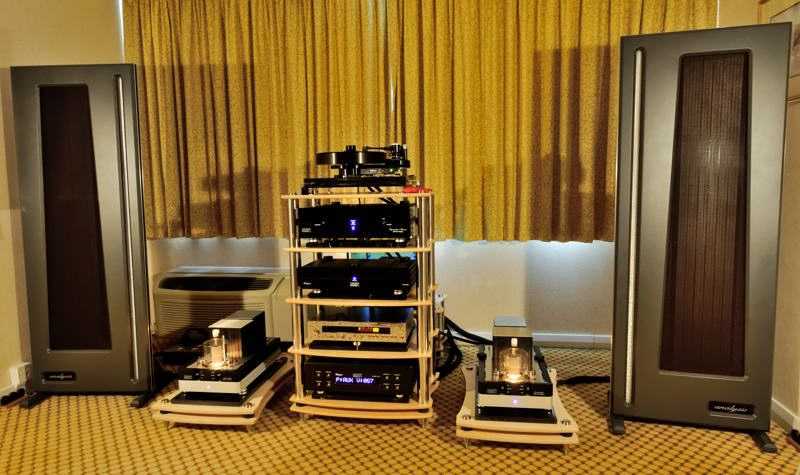 Music was provided courtesy of an Astin Trew 3500plus CDP through an AT1000 valve preamp and 5000 power amp. Air also distributes the crossover free Audience ClairAudient speakers which were being used as well as the Acoustic Signature record deck in the set up. The room was arranged with the speakers firing across the room which gave a wider image than most of the other spaces. Although not launching anything new at the show, Astin Trew are planning a new phono stage and a new DAC for later in 2011. Just before I left, Michael also demonstrated "The One" speaker by Audience - a tiny cube claiming a flat frequency response to 40hz. They sounded a bit light immediately after hearing the main rig and the sound was undoubtedly affected by break through from the sub woofer next door, but it was evident that they had a good tone and could be worth a look for anyone needing tiny speakers. A lot of the systems lacked weight and authority to my ear. This certainly wasn't the case with the Adam Audio room. The big Tensor floorstanders sounded immediately impressive, driven by a stack of heavy duty McIntosh electronics. Audionote featured their AN-E 94db high efficiency speakers driven by their own brand electronics. This setup sounded immediately clear and open although the room was too small to do it justice. In terms of conventional stereo, Bowers & Wilkins (B&W) were highlighting their CM8, another small floorstander, although they were giving as much space to their Zeppelin iPod speakers and its use of Apple's Airplay streaming technology as part of a big focus on i-Pod and wireless. Moving downstairs we found more large floorstanders, the SP1 Signature by SP Acoustics. Driven by Plinius electronics from New Zealand, these gave good scale and bass although the imaging wasn't all I'd have expected from a £15K speaker, quite possibly the result of having such a big speaker in such a small room. Pressing on, Tannoy were next up, showing a new compact floorstander, the DC6T. This struck me as an easygoing, natural sounding speaker. Then a competing small floorstander in the next room from Dali, part of its Ikon range. That seemed to be producing a pretty big sound for a small speaker although by this time I was wondering if I would be bothered if I never heard another Mark Knopfler solo album in my life - so many seemed to be using them to demonstrate their kit. 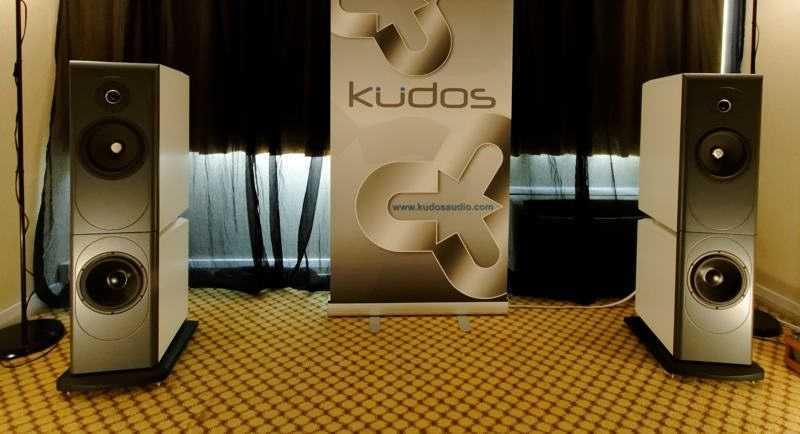 Back to the high end in the next room with another small speaker manufacturer, Kudos Audio. Powered by Naim electronics their Titan T88 (£12,950) loudspeakers were up there with the best sounding set ups in the show. The speakers were of an unusual design in that each of the pair consisted of two cabinets. The upper cabinet is ported into the boundary gap between the cabinets. In the lower were two bass drivers in an unconventional out of phase isobaric configuration. All of the drivers were manufactured by SEAS. Seemed a pretty harmonious arrangement. After Kudos I pressed on to the last few rooms of my visit. Cabasse was showing a very pretty small globe speaker, the iO2, on dedicated curved stands, as part of a sub-sat system. With co-axial drivers this promised coherent imaging but the choice of highly compressed and harsh pop music to demo their strengths did them no favours. A switch to Fleetwood Mac suggested that they might do better with better recorded sound but I suspect they could be very fussy about set up and choice of material. Monitor Audio were showing new Gold GX loudspeakers. 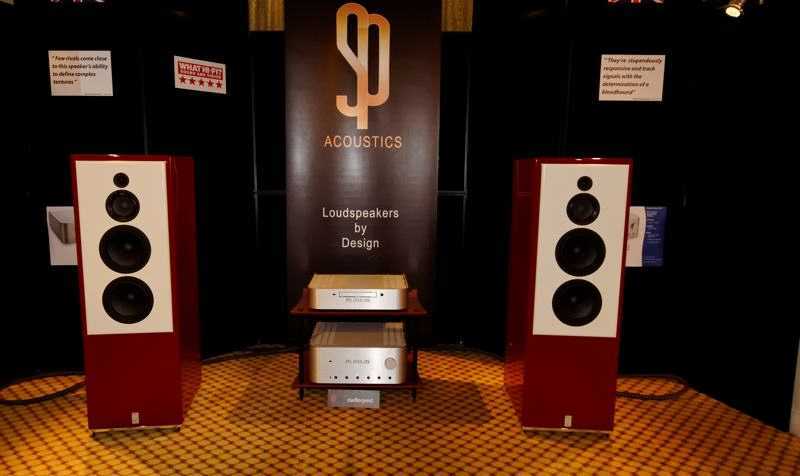 Substantial floorstanders, these looked pretty brash to my taste but sounded fine. Acoustic Insight were demonstrating their Arousal VS speakers - their publicity material quotes the recommendation that TNT Audio gave the product a couple of years ago. They sounded fine to me although, as with many demos, the ambient noise level was too high to make any real assessments. Michell Engineering had a display of their turntables including the Gyro 'SE'duction. Their room was pretty crowded - I guess all of the vinyl aficionados had made a beeline for them as about the only turntable manufacturer with a range of analogue equipment on show. The Naim rooms were also very crowded and I confess I didn't try to elbow my way in. Their main demonstrations were scheduled to be of wireless music distribution products. Triangle, the French speaker maker, was showing new red speakers. Although the focus, curiously, seemed to be on the launch of a new colourway, these had a good tight bass and natural sound - struck me as good for a small and fairly economic speaker. Also very good was the sound in the Castle room, playing a reggae cover of Wish You Were Here by Alpha Blondy. Given that this was driving out of small bookshelf speakers, the Knight 2, it was a pretty impressive performance and I suspect this will be a very successful little speaker. Much of the ground floor was given over to static displays. In the large exhibition space, the German manufacturer Quadral was showing a wide range of loudspeakers, introduced to the UK during 2010 although, I was led to understand by Tom Hyde of their UK distributor, they are a well established speaker maker across Europe. Marantz had an exhibition display, their main new launch being of a Blu-Ray player, rather outside the scope of my interest. Meridian Audio was showing three new products, the Soolos Media Core (hard drive and distribution system), DSP3200 active loudspeaker and a Audio Core 200 Controller. Disappointingly none of this was on demo so I can't tell you what it sounded like. Cable manufacturers were fairly well represented. Chord Company appeared to be doing a brisk trade in discounted interconnects. Atlas Cables, Vertere Pulse Cables and Nordost all had rooms but time became too short to take these in at the end of the day. At the end of all that I found myself wondering if I could draw any general conclusions. I think I can, at least provisionally. Firstly, it's that a show like this is a big, messy affair and it's a tribute to the companies that created a halfway decent sound that they managed to do so. Secondly, it looks like "Real Stereo" is alive and well and co-existing with 3D TV and other multimedia developments. The vast majority of rooms were playing two channel music even if the source has become more diverse, with many driven from Macs, iPads or notebook PCs. The middle ground between conventional and multi channel seems to be becoming occupied by hard disk and other streaming technologies that are likely to line up alongside, or maybe challenge CD for its place at the table. Getting a share of this new arena is a key focus of the big audio firms - Naim, Meridian, Marantz, and others, with the USB DAC growing in importance to of all the electronics manufacturers. Vinyl remains important as a source in high end systems but no low end vinyl replay systems were being demonstrated leading me to think that the vinyl resurgence remains an important, but ultimately pretty niche phenomenon. All in all a somewhat frantic but nevertheless enjoyable day out. There is no other way to see and hear so much equipment in such a short space of time. Much of the equipment on display could also be bought at a discount so, for those who had done their homework in advance, it might also have offered a good opportunity to negotiate a deal. Recommended.